I've forgotten where this info came from. Sorry! Edited by yours truly (contact me). The image came from Amazon. 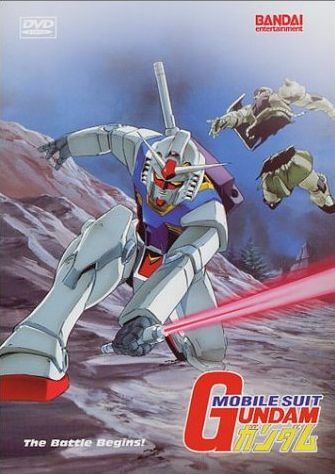 Before Gundam Wing, Endless Waltz, 08th MS Team, and all the other sequels, there was Gundam. This is truly one of the best anime classics of all time. When it aired in 1979, it wasn't very popular with audiences, so that cutting the planned 52 episodes to 39 was in the cards. But the creators managed to wrangle a one month extension so they could wrap up the story, giving it a total of 43 episodes. After the 43 episodes were aired, the show was canceled. When the re-runs came, it started getting people's attention. In 1981, the show was so popular that the creators turned it into a movie trilogy. The first movie was basically made up of old TV footage, while the second movie had about 30% new animation, and the third movie had about 70% new animation. Anyway, both the TV show and the movies put Gundam at the top and spawned several sequels. And now, here's the story. Due to overcrowding on Earth, the 'Earth Federation' starts construction on space colonies called 'Sides'. Ever since then, over half of the world's population has lived peacefully in these Sides, until the year UC (Universal Century) 0079. Colonists of Side 3, calling themselves 'The Independent Duchy of Zeon', declare their independence from the Federation and declare war. Nine months pass, with Zeon getting the upper hand thanks to their mobile weapons called 'Zakus', and over half of the world's population dead. But then the Federation constructs the Assault Carrier White Base and the Mobile Suit Gundam to counterattack the Zeon. They are moved to Side 7 where the Zeon try to screw the whole plan up by destroying the research labs. In the midst of the conflict, a 15-year old teen named Amuro Ray (son of Tem Ray, the man behind the Gundam project) encounters the Gundam, and with the manual on his lap, combats the Zakus and beats them. Soon after, Amuro and friends are enrolled into the White Base, and so they set off battling all Zeon they encounter along the way. During the journey, the theory that special humans called 'Newtypes' becomes realized as Amuro and Char prove it with their combat skills.